“A Day in the Life” is a presentation of findings that emerged during the initial phase of this consumer- driven research project. The North Central Regional Mental Health Board (NCRMHB) initiated this project to contribute to the statewide efforts to transform Connecticut’s behavioral health services system. o a learning opportunity for persons in recovery and their family members, medical professionals, housing specialists, college students and faculty, and community and faith-based organizations. NCRMHB supported and funded the first year of the project that has culminated in the DVD production. The DVD can be viewed below or ordered through the NCRMHB. Additionally, arrangements can be made for a member of the research project team to lead a facilitated discussion following the showing of the DVD presentation. To place an order, please contact the NCRMHB through Marcia DuFore by phone at 860-667-6388 or by e-mail at info@ncrmhb.org. A video featuring the stories of those living with mental illness in Connecticut. 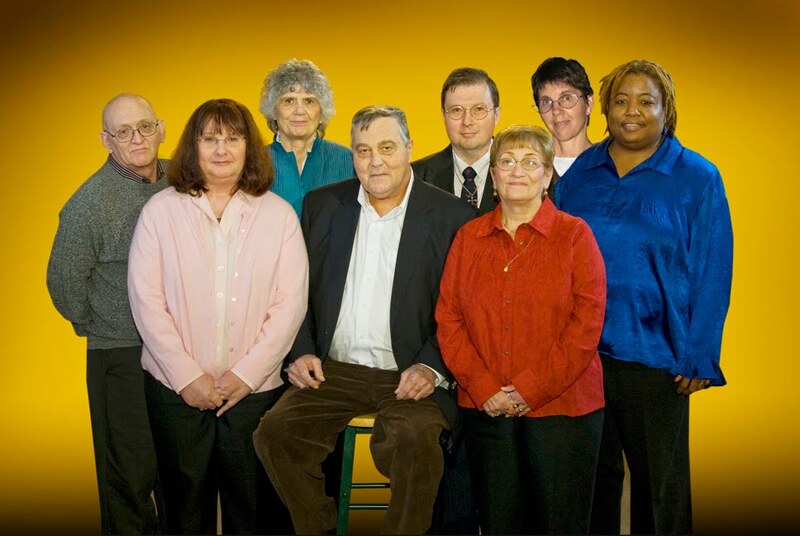 Original participant research team was assembled in April 2007, and included Brian, Paul, Carol, Margaret, Mike, Jim, Selina, and Judith Shaw, Project Director. During the Spring 2010, 2 team members resigned and Catherine joined the team. NCRMHB participant researchers completed the initial project activities including: the development of research goals, research design and training; active research; and development and dissemination of initial findings. Through the narrative analysis of 25 individuals’ accounts, initial research findings illuminate the participants’ daily life experiences, their beliefs and perceptions and their accounts of their social interactions. Many partners, recognized in the Acknowledgements, have collaborated with NCRMHB to make this research project possible. NCRMHB completed the final phase of the project during June 2012. As a qualitative research project, “A Day in the Live” was also consumer-driven participatory research: all research interviewers have had experiences utilizing mental health services and all individuals who participated in research interviews were then receiving DMHAS-funded rehabilitation services and/or treatment for mental illness and substance use. Before any research activity was begun, participant researchers received extensive training through Yale PRCH on qualitative research methods. o to develop analysis of individual narratives and to report on the findings. To build community interest in “A Day in the Life” project, Margaret Sirota designed the project logo and brochure. Margaret Sirota and Mike McDermid, both research team members, created graphics for the poster to enhance future presentations. o individuals’ narratives were transcribed word-for-word in the tradition of oral history. Feedback loops were created to provide opportunities for audience members to share their reactions to the live presentations. “Take-away messages” appeared to vary by event, since each presentation was geared to a particular audience. o A DVD of the live presentation was professionally produced and is now available. o Public service announcements and news stories appeared in newspapers and on radio stations, local access community television, and church bulletins. o Enfield public access television interviewed some of the project researchers and then broadcast the interview to local audiences. o Live presentation was delivered at an international conference in Hong Kong (May 2011), sponsored by New Life Psychiatric Rehabilitation of Hong Kong and China and by Yale PRCH. o experiences of systematic social exclusion described by some people with mental illness,. o impart new understandings of the lives of individuals with mental illness. o create a repository for life stories from some Connecticut residents who were obtaining mental health and substance use services during the early Twenty-first Century. Through the generous funding of DMHAS, NCRMHB renewed its work on the project in December 2011, with a final completion date of June 2012. Project researchers will conduct thematic analysis of the remaining 55 interviews, develop findings and disseminate a reports of those findings. 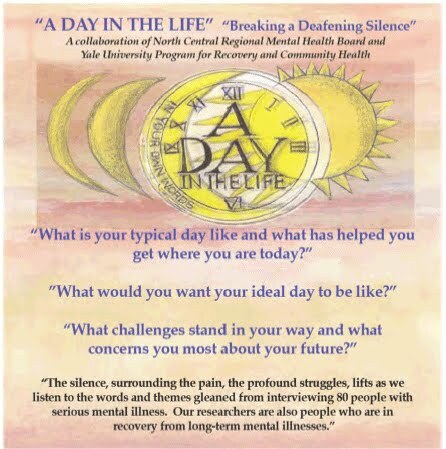 For more information on the "A Day in The Life" Project, please contact NCRMHB. To place an order, please contact the NCRMHB through Marcia DuFore by phone at 860-667-6388 or by e-mail at info@ncrmhb.org.